Knowing whether aquaculture in developing countries helps the poorest in communities is an important question for development agencies who want to make pro-poor investments. Historically, there have been two arguments that it does not. First, to be a fish farmer you need to have a certain amount of wealth, so the poorest are unable to become producers. Second, aquaculture tends to produce larger, high-value fish that are too expensive for the poorest consumers. A new study, by Kazi Ali Toufique from the Bangladesh Institute of Development Studies and Ben Belton, a WorldFish scientist, shows that the second of these arguments doesn’t hold. What is impressive and unusual about this work is that it separates the pro-poor contribution made by aquaculture from overall reductions in poverty, caused by the broader growth of the economy. 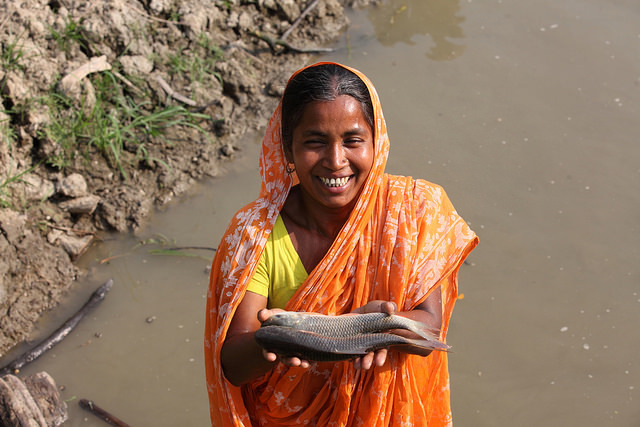 It achieves this by using household income and expenditure surveys in Bangladesh to look at how fish consumption has altered over time for different income groups. The study shows between 2005 and 2010 average per capita fish consumption grew by 28.6%, largely because economic growth in general led to increased household income. We know this increased demand for fish was supplied by aquaculture growth because production from wild fisheries fell during this period. In fact, if the supply of fish from aquaculture had remained constant at 2000 levels, average consumption would have fallen to 26% by 2010. Toufique and Belton go on to show that beyond the benefits of economic growth in general, aquaculture growth itself had a strong pro-poor effect because, although non-poor households showed the highest increases in farmed fish consumption, the rate of increase was about twice as large for poor consumers. This result occurred because the expansion of aquaculture stabilized or reduced the price of both wild caught and farmed fish so that they became more affordable as incomes rose. The messages from this paper provide important insights for development agencies. First, beyond the broader contributions towards economic growth in rural economies, investing in aquaculture can have important effects on fish prices that keep them within the reach of poor consumers. Second, pro-poor returns of aquaculture investments are greater when other investments to support wider pro-poor economic growth are in place. Third, due to the price stabilizing effect of aquaculture, capture fisheries remain sustainable and productive and can further enhance pro-poor impact. That’s three good reasons why investments in both fisheries and aquaculture make sense and the solid evidence we need to make sound investment decisions. Is Aquaculture Pro-Poor? Empirical Evidence of Impacts on Fish Consumption in Bangladesh is a contribution to the WorldFish led CGIAR Research Program (CRP) on Aquatic Agricultural Systems and the Livestock and Fish CRP, as well as an output of the Aquaculture and the Poor: Improving fish production, consumption and nutrition linkages project, funded with the financial support of the Federal Ministry for Economic Cooperation and Development, Germany . Stephen Hall's previous leadership roles include CEO of the Australian Institute of Marine Science (AIMS) and Professor of Marine Biology at Flinders University, Australia. Stephen has served on several international advisory panels and, in 2010, was a member of a global team overseeing the reform of the Consultative Group for International Agricultural Research (CGIAR). Recognized as a leading scientist in his field, he has contributed more than 80 scientific publications on fisheries ecology and environmental issues as well as a highly cited book on the environmental effects of fishing. In 2004, Stephen was awarded a Pew Fellowship in Marine Conservation and he continues to investigate and write on the roles and potential of fisheries and aquaculture for supporting international development objectives. In 2005, he was awarded the Australian Public Service Medal for leadership of AIMS. 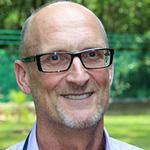 Stephen holds a Ph.D. in Marine Ecology from St. Andrews University and a B.S. in Marine Biology and Biochemistry from University of Wales, Bangor.